Arduino enthusiasts may be interested in a new small form factor Arduino development board called the Firecricket, which is this week launched via Kickstarter to raise the funds required to go into production. 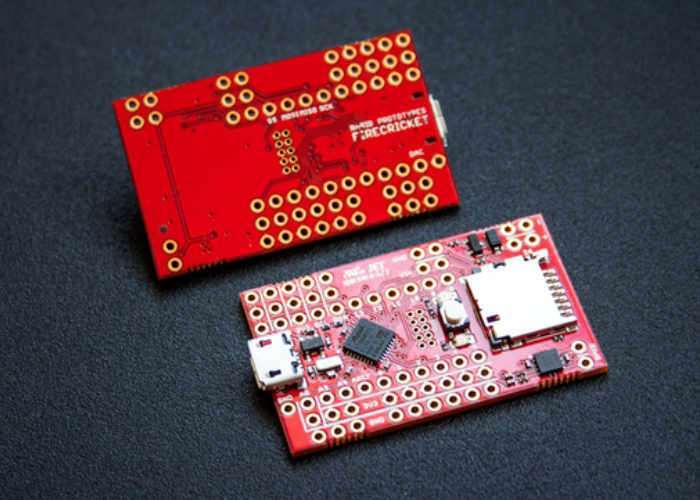 The Firecricket offer is a small light, sound, and motion controller that is equipped with a 48MHz 32-bit ARM Cortex M0+ microcontroller w/ 16K of RAM, a MicroSD slot. Watch the video below to learn more about this open source hardware which has been created by Rabid Prototypes. Rabid Prototypes explain more about their latest Arduino development board which is now available to backfire Kickstarter from just $25, with shipping expected to take place during July 2017. The Firecricket is designed to add light, sound, and motion to replica props from your favorite movies, video games, TV shows, and comics. It’s a must have for any cosplayer or anyone who wants to add some extra flair to their Halloween costume or decorations! But the only limit to what you can do with it is your imagination! Use it to add lights and sounds to a toy car or space ship. Or, make a favorite stuffed animal talk and “purr” with a vibration motor. Or, place it in a chest with a limit switch on the lid and a high power LED and have it play the fanfare from the Legend of Zelda whenever it’s opened. The possibilities are endless! For more information on the new Arduino Firecricket development board jump over to the Kickstarter website for details by following the link below.